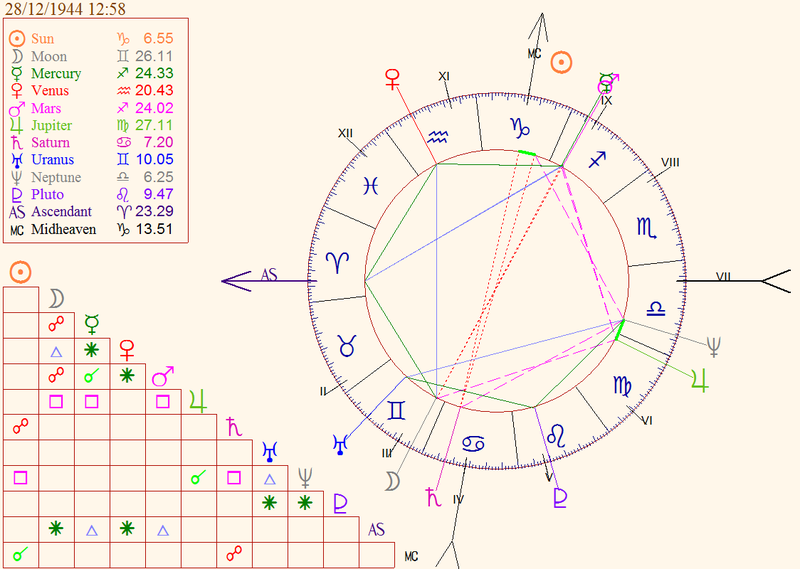 Looking at the structure of his natal chart, we immediately notice that we are dealing with an hour-glass pattern 'expanded' tending the locomotive pattern. As often happens for the eccentric and unpredictable personality, the theme can not be fully inserted ina default schema. His 'temperament' base tends to be a hour-glass, with great communication skills and willingness to create correlations between the disparate fields of life and knowledge, with remarkable ability to adapt (which has always been clear from thenumerous experiences recounted in his autobiography, " Dancing Naked in the Mind Field "). Planet that 'opens the dances' and then of some importance in its theme (the first sign of the natural order) is an ingenious Uranus in Gemini, which drives the true scientist tirelessly to seek the causes of phenomena, but also solutions to problems, characteristic of minds able to properly analyze the detail without losing sight of the whole. The night hemisphere is then closed by a water Neptune (trine to Uranus in II field) that has guaranteed that dose of imagination (and curiosity about the biomedical issues) that went to compensate the shortage of the water element (7.3% versus a 25% theoretical). Neptune in VI (it also plus rules the XII), moderately discordant, leads to poisoning by drugs and chemicals in general, and those are certainly not lacking: it suffered a major poisoning with nitrous oxide (sweet air) and the Diethyltryptamine (DET) and in the first case he risked his life. Also the presence of Neptune in Balance had the opportunity to speak with the attack of ‘Loxosceles rofuscens’ who gave a beautiful row to hoe with and the burns who obtained with many explosions in the laboratory has been involved. It 's also interesting to note that the most accurate aspect of its theme (with a lower orbit) involves Uranus in II in sextile with Pluto in V: propensity for deep investigation and, in view of the houses involved, especially the channeling of creative energy deep (Pluto in Leo V) to achieve an objective scientific and technical (Uranus) with important gains and increased public visibility (camp II). Its success is further based on the astrological combination Capricorn ASC Aries, a combination horoscopic traditionally considered among the best for two cosmic correspondences that complement and enhance each other, because the energy disorganized and impulsive Aries are hardened and educated by the coolness and patience capricornine, so that we can carry through quietly brilliant projects previously developed (Mullis also has a Jupiter in Virgo and discordant in VI that perhaps is related to the troubles caused by employees or contractors only apparently zealous. The Moon in III, in higher personality, sometimes leads to success in a field related to the sign that the hosts, in this case Gemini, so the intellectual field (also literary? :D ). Uranus sextile Pluto is also typical of a generation (In Mullis this aspect is very strong), which digests very bad injustice because they cause a deep sense of innerturmoil. The dissent is shouted to the world 'without ifs and buts'. Mullis has always been veryintolerant of wasting public funds only to ensure the survival of some institutions that prove self-referential: "The National Oceanic and Atmospheric Administration hires people who advance their careers by telling us about the hypothetical effects of sulfate aerosols, as though there were a real, scientifically sound connection between sulfate measurements and the weather in the next millennium [...] Reports of skin cancer may be increasing, but that isn’t a good indication of UV levels. Increased skin cancer might have been caused by people moving to sunnier climates. [...] To measure the amount of UV reaching the Earth unambiguously, you would not measure cancer, you would measure the UV light reaching the earth”. That time of nitrous oxide risked his life and was saved in extremis by an intervention of a friend 'from the astral plane' (as reported by himself). And once they had synthesized some dietiltriptamina (DET) mistakenly took a dose ten times larger and he was dazed and depersonalized several days. In short, the Aries impulsiveness often led him on distant shores where it has always ventured willingly, with a sun in the Campo IX is a wedding invitation! It 's also interesting to note that the Sun,' who rejoices in the ninth field ', both for its location in the lucid and rational Capricorn and for the square with Neptune, was never influenced by the spiritual experiences that point to change its life project: "Something I have noticed about other-worldly aspects to my life is that they don’t tend to change a lot of what you had been doing already. They add something to what you might call the depth but not the direction. The pronounced sexual charge (ASC Aries, Pluto in V) accounts for its undeniable passion for women, he had in fact several relationship and has been married three times. 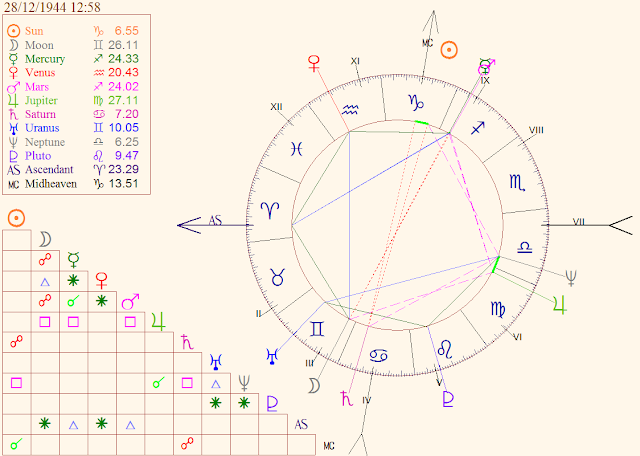 The axis of greatest stress and home to the opposition in his chart III-IX is to be expected and there was also a scientist at this level, but open to the diverse experiences (thanks to Mercury and Mars conjunct in IX, the source the insatiablecuriosity). 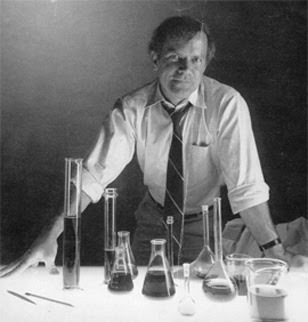 Mullis took an interest also in astrology, intrigued by a little girl who guessed his sun sign, an event which was then repeated several times in different situations: "THE REASONS I took up biochemistry as a profession were simple. With Mercury and Mars in conjunction in Sagittarius, I was not going to specialize in something well-defined and manageable. I didn’t think of myself as a worker, or a specialist. I thought of myself as a man of deep science with a Gemini moon in my face and the cold, red winds of Mars in my hair. I wanted to see reality, if possible, and my Capricorn sun felt a strong need to make a living. Astrology by itself is not the answer to all our problems any more than herbs from the Amazon witch doctor, but it’s a shame to waste such a vast and ancient resource because of the simple fact that our modern witch doctors are too frozen in their attitudes to look around. Personally the thing that strikes me most is that Mullis is an honest scientist and a sincere man. He does not have blinders on as many scientists, most of which will not result in any significant contribution to science. It is not yet a fan of anything. And the New York Times can rant how much he wants to complain that Mullis took advantage of his fame to express opinions on relevant issues important and atypical. And then say that perhaps HIV is not the sole cause of AIDS because many things do not return and would be considered in greater depth, because it makes so nervousthe authorities? A man that meets Montagnier (the discoverer of HIV) and asks him what is the most important work to mention to demonstrate conclusively that HIV causes the onset of AIDS and Montagnier says ''there isn't"...will also be entitled to wonder about? Moreover Montagnier two years ago publicly made statements that bring him close to the position of some sections of dissidents (the protesters of the classical theory on AIDS). We speak of the man who received the Nobel prize for discovering HIV, which makes things more confusing and disorienting the citizen. The vast majority of the world is invisible to our eyes regardless of the brightest of our lights, and we can’t hear more than a tiny bit of the sound of it with our ears, and we can’t feel the subtle textures of it with our fingers. Even with all our instruments, long tubes on mountains, and a Hubble telescope in space, we are blind to the myriad of complex energies that are whirling and vibrating and clattering all around us day and night, year after year, millennium after millennium. The appropriate demeanor for a human is to feel lucky that he is alive and to humble himself in the face of the immensity of things and have a beer. Relax. Welcome to Earth. It’s a little confusing at first. That’s why you have to come back over and over again before you learn to really enjoy yourself. NOTE: The phrases in cursive of Mullis are all taken from his "Dancing naked in the mind field"